Parents in Michigan and Alabama report being shocked when their children’s fidget spinners burst into flames. They might be the bane of parents and teachers everywhere, but fidget spinners have enjoyed wild popularity. They’ve evolved from basic spinning devices purportedly designed to keep fidgety, bored children occupied to more complicated versions that contain LED lights and lots of other bells and whistles. Some fidget spinner manufacturers have even started putting Bluetooth technology in their spinners. The problem? The tiny internal lithium ion batteries responsible for emitting lights and allowing fidget spinners to charge have started catching fire. According to Time and others, there have been at least two separate cases of Bluetooth-enabled fidget spinners catching fire and melting the surfaces they were sitting on. The mother also stated that the device hadn’t been plugged in long — less than 45 minutes — when it caught fire. Obviously, the fire could have done serious damage to the home had the family left the device plugged in and charging while they were away. And because fidget spinners are marketed to children, it’s terrifying to think what could happen if a child left one charging next to his bed — or in the bed during sleep. If this sounds familiar, it’s because similar incidents have happened before — most recently in hoverboards and mobile phones. News outlets in Chicago have reported that a nine-year-old child’s phone caught fire in his pocket while he was in his third grade classroom. In Philadelphia in March 2017, two young girls and a firefighter were tragically killed when a hoverboard inside a home caught fire and burned out of control. The two children died due to burn injuries, and the firefighter died in a car crash while responding to the scene. If you or a loved one has been injured by a product or toy that caught fire, get in touch with a Pennsylvania burn injury lawyer right away. 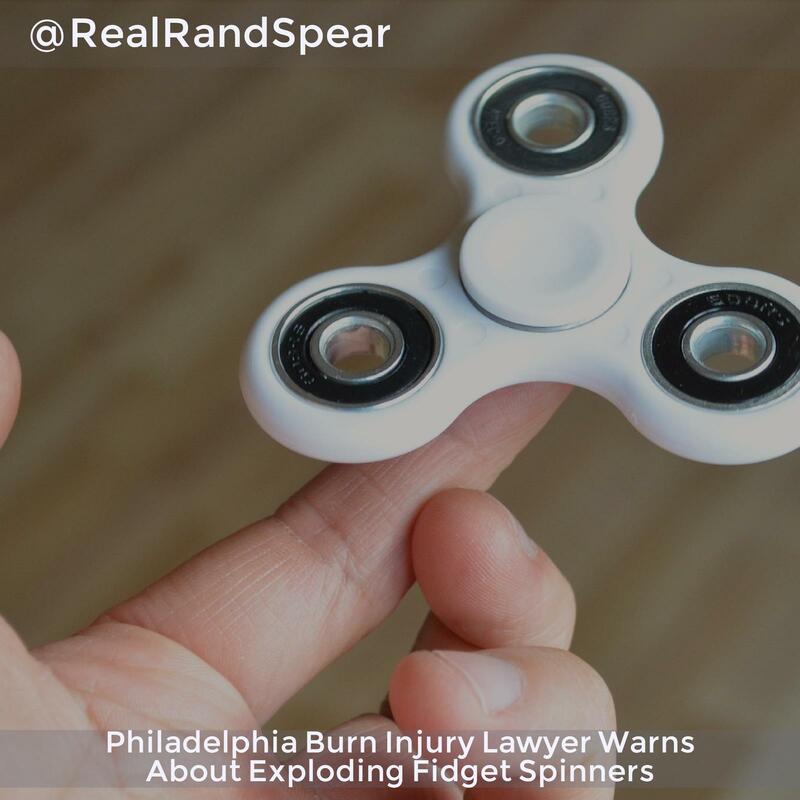 Contact Philadelphia and New Jersey burn injury lawyer Rand Spear today at 877-GET-RAND.